Please add more channels under this thread, if you can receive any other UHD channel. 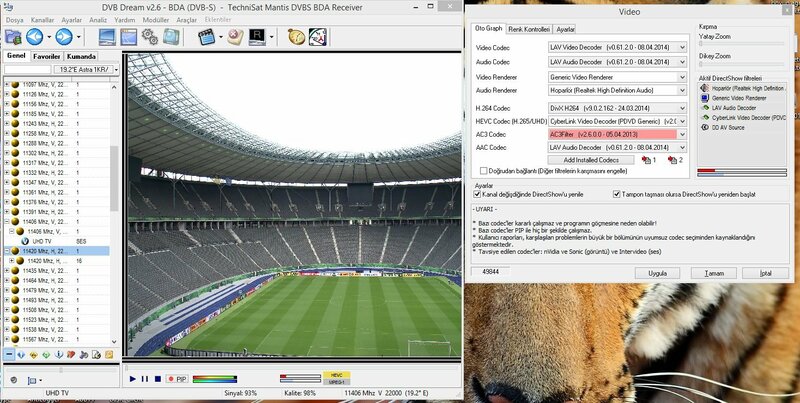 Hotbird 13.0Â°E 10930, H, 27500 DVB-S2 8PSK "4kTV HEVC 50 fps"
Astra 19.2Â°E 11406, V, 22000 DVB-S2	8PSK "Astra Ultra HD Test"
Astra 19.2Â°E 10995, H, 22000 DVB-S2 8PSK "sid001/ses"
Hispasat 30.0Â°W 10730, V, 30000 DVB-S2 8PSK "TVE 4k Test"
Regards been nice to work dvbdream 2.6 version has all three of 4k test broadcasts have opened, but a little freeze your hand health can be improved further good work. If you can not open channel to channel update all the features you also will find the right make HEVC type of video display will exit. Last edited by azimli on Sat May 31, 2014 1:42 pm, edited 1 time in total. CPU usage are nice but freezing maybe I need to work on the publication of his origin. DVB-T2 on Paris Tour Eiffel transmitter : channel 26 (experimental, 1kW), "Test UHD1" and "Test UHD2"
Latest LAV installed, no problem decoding other AAC audio files. Is it an issue related to DD or LAV ? 19 degrees Mainconcept AAC codec for UHD channel i see you've installed the program, but did not hear. (2 sec voice came and went a break) You wonder how did you do? thank you. Has licensed DivX AAC Decoder dn I'm in. Thanks. What kind of Hardware do you use for DVB-T2 UHD? We have test UHD here in Korea but no idea which card is suitable for me..